Yellow tape roped off the entrance to K Sandwiches after a shooting. Image courtesy of Lan Dang. 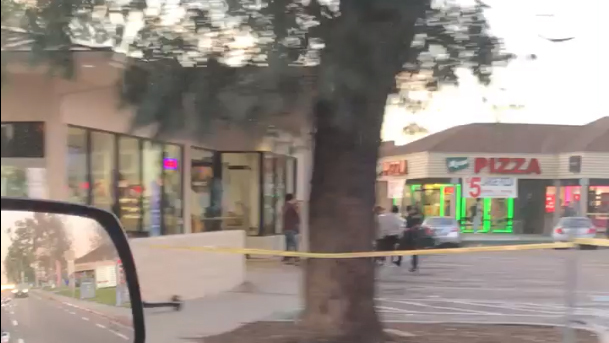 One person was hurt in a shooting Tuesday afternoon at a popular Vietnamese sandwich shop in Linda Vista, police said. The shooting happened around 4:30 p.m. at the K Sandwiches shop, 7604 Linda Vista Road, near Kearney High School, San Diego police Officer John Buttle said. Four people, described as Kearney High and Mesa College students, were fighting outside the sandwich shop and a group of 10 people was standing and watching when the four shots rang out and everyone scattered, he said. One of the bullets shattered the windows at the entrance to the store, the officer said. One person was hurt by the broken glass, Buttle said. The extent of the victim’s injuries was not immediately clear. One of the suspects was in custody, the other three were still on the loose, police said.